“Phone rings, door chimes, and in comes…” a whole galaxy’s worth of critics’ stars for Company! Marianne Elliott’s reimagining of Sondheim’s classic musical has announced it has extended booking at the Gielgud Theatre through to 30 March 2019, following an overwhelming critical reception. 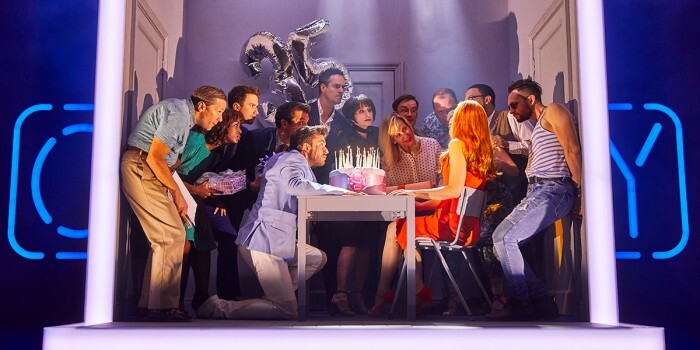 Starring Rosalie Craig in the central role of Bobbie, alongside Patti LuPone, Mel Giedroyc and Jonathan Bailey, Company’s story of life, love and marriage opened last night (17 October) to a star-packed audience which included Emma Thompson, Graham Norton, Andrew Garfield and Andrew Scott, amongst others. And now the production has revealed that a further 100,000 tickets for the run will be released. Company is directed by Marianne Elliott, Artistic Director of Elliott & Harper Productions, a company she founded in 2016 with producer Chris Harper. Marianne was awarded an OBE in the 2018 Queen’s Birthday Honour’s List for her services to theatre. In this new production of the classic Broadway musical, Company sees the central character of Bobbie portrayed for the first time as a woman. Featuring the classic Sondheim songs The Ladies Who Lunch, Being Alive, Side by Side and You Could Drive A Person Crazy, the story starts at Bobbie’s 35th birthday party – where all her friends wonder why she isn’t married. So don’t miss one of the must-see musicals of the season – if you catch it, you’ll be in good Company!